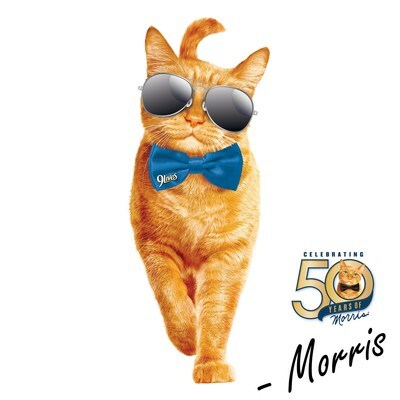 ORRVILLE, Ohio, Oct. 25, 2018 /PRNewswire/ -- Prior to scrolling through #catsofinstagram, we were obsessing over Morris, the original celebricat. 50 years ago, this famously finicky feline rose to fame and stole our hearts as the original spokescat for 9Lives® cat food. Originally adopted in October 1968 from the Hinsdale Humane Society in Illinois, Morris now serves as an ins-purr-ation to cats across the country. "The last 50 years have been absolutely paw-some – a dream come true for a shelter cat," said Morris. "I had a humble beginning in the shelter, now I'm shaking paws, taking selfies, acting alongside my favorite celebrities and promoting cat adoption across the country. It's all in a day's work for the original celebricat, and all thanks to 9Lives cat food." Despite his fame, Morris has always been a passionate advocate for adoption. He has loved traveling the country, visiting countless schools and helping children and adults understand the importance of treating animals with kindness. In 2006, he launched Morris' Million Cat Rescue® to help save animals in need of forever homes. Morris understands the profound effect adoption has on animals, has never forgotten his humble beginning as a shelter cat, and is committed to helping shelter cats find homes and loving families. Since 1959, 9Lives cat food strives to celebrate and champion all cats. The brand is dedicated to the health and happiness of cats everywhere and believes that all cats deserve to live well. Visit www.9Lives.com to learn more about Morris' story as he celebrates his 50th Adopt-i-versary this year.